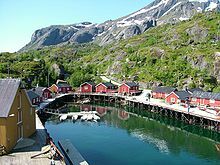 Lofoten (Norwegian pronunciation: [ˈluːfuːtn̩]) is an archipelago and a traditional district in the county of Nordland, Norway. Lofoten is known for a distinctive scenery with dramatic mountains and peaks, open sea and sheltered bays, beaches and untouched lands. Though lying within the Arctic Circle, the archipelago experiences one of the world's largest elevated temperature anomalies relative to its high latitude. 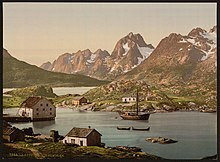 "Raftsund, Lofoten, Digermulen, Norway", c. 1890–1900. "There is evidence of human settlement extending back at least 11,000 years in Lofoten, and the earliest archaeological sites ... are only about 5,500 years old, at the transition from the early to late Stone Age." Iron Age agriculture, livestock, and significant human habitation can be traced back to c. 250 BC. 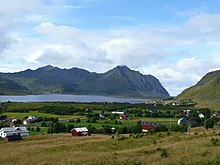 The town of Vågan (Norse Vágar) is the first known town formation in northern Norway. It existed in the early Viking Age, maybe earlier, and was located on the southern coast on eastern Lofoten, near today's village Kabelvåg in Vågan municipality. However, the Lofotr Viking Museum with the reconstructed 83-meter-long longhouse (the largest known) is located near Borg on Vestvågøy, which has many archeological finds from the Iron Age and Viking Age. The islands have for more than 1,000 years been the centre of great cod fisheries, especially in winter, when the cod migrates south from the Barents Sea and gathers in Lofoten to spawn. Bergen in southwestern Norway was for a long time the hub for further export south to different parts of Europe, particularly so when trade was controlled by the Hanseatic League. In the lowland areas, particularly Vestvågøy, agriculture plays a significant role, as it has done since the Bronze Age. 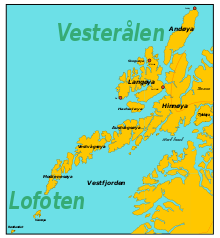 Lofotr was originally the name of the island of Vestvågøy only. Later it became the name of the chain of islands. The chain of islands with its pointed peaks looks like a lynx foot from the mainland. In Norwegian, it is always a singular. Another name one might come across, is "Lofotveggen" or the Lofoten wall. The archipelago looks like a closed wall when seen from elevated points around Bodø or when arriving from the sea, some 100 kilometres (62 miles) long, and 800–1,000 metres (2,600–3,300 feet) high. In March, 1941 the islands were raided by British Commandos during Operation Claymore, and in a subsequent diversionary attack to support the Vaagso raid in December. As of 2017, the islands attract one million tourists a year. The Lofoten Islands are characterised by their mountains and peaks, sheltered inlets, stretches of seashore and large virgin areas. The highest mountain in Lofoten is Higravstinden (1,161 metres (3,809 feet) in Austvågøy; the Møysalen National Park just northeast of Lofoten has mountains reaching 1,262 metres (4,140 feet). The famous Moskstraumen (Malstrøm) system of tidal eddies is located in western Lofoten, and is indeed the root of the term maelstrom. Geological map of Lofoten and Vesterålen. Lofoten is a horst ridge of bedrock. The rocks of Lofoten belong to wider the Western Gneiss Region of Norway. Some of the high relief and irregular surfaces of Lofoten has been attributed to etching that took place during the Mesozoic Era. Evidence of this would be the kaolinite found at some locations. To the northwest the Lofoten archipelago is bounded by the NE–SW-trending West Lofoten Border Fault. This is a normal fault whose fault scarp has been eroded forming a strandflat. 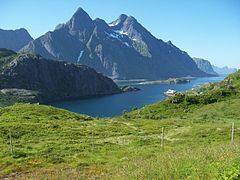 In Vestvågøya mountains have steep slopes towards the open sea in the northwest and southeast while slopes ponting towards the interior of the island are more gentle. This is the result of erosion acting on a landscape that has been uplifted along NE–SW-trending faults in the margins of Lofoten while the interior axis has remained more stable. In tectonic terms mountains are half-grabens and faults are of the dip-slip type. The sea around Lofoten is known to host significant oil reserves. The reserves amount to 1.3 bn barrels. Oil extraction in the Lofoten area is however prohibited. The sea is rich with life, and the world's largest deep water coral reef, called the Røst Reef, is located west of Røst. Approximately 70% of all fish caught in the Norwegian and Barents seas use its islands' waters as a breeding ground. Lofoten has a high density of sea eagles and cormorants, and millions of other sea birds, among them the colourful puffin. It has mainland Europe’s largest seabird colony. Otters are common, and there are moose on the largest islands. There are some woodlands with downy birch and rowan. There are no native conifer forests in Lofoten, but some small areas with private spruce plantations. Sorbus hybrida (Rowan whitebeam) and Malus sylvestris occur in Lofoten, but not further north. The animals mistaken for the extinct great auk turned out to be some of the nine king penguins released around Norway’s Lofoten Islands in August 1936, there until at least 1944. Lofoten features a subpolar oceanic climate (Cfc) under the Köppen climate classification. Winter temperatures in Lofoten are very mild considering its location north of the Arctic Circle – Lofoten has the largest positive temperature anomaly in the world relative to latitude. This is a result of the Gulf Stream and its extensions: the North Atlantic Current and the Norwegian Current. Røst and Værøy are the most northerly locations in the world where average temperatures are above freezing all year. May and June are the driest months, while October has three times as much precipitation. The warmest recording in Svolvær is 30.4 °C (86.7 °F). Strong winds can occur in late autumn and winter. Snow and sleet are not uncommon in winter, the mountains can have substantial amounts of snow, and in some winters, avalanches might come down from steep mountain slopes. Two of the top ten deadliest rainstorms ever recorded passed through Lofoten. In Svolvær, the sun is above the horizon continuously ("midnight sun") from 25 May to 17 July, and in winter the sun does not rise from 4 December to 7 January. In Leknes, the sun is above the horizon from 26 May to 17 July, and in winter the sun does not rise from 9 December to 4 January. The temperature in the sea has been recorded since 1935. At 1 metre (3 feet 3 inches) depth in the sea near Skrova, water temperatures varies from a low of 3 °C (37 °F) in March to 14 °C (57 °F) in August, some years peaking above 17 °C (63 °F). November is around 7–8 °C (45–46 °F). At a depth of 200 metres (660 feet), the temperature is near 8 °C (46 °F) all year. Lofoten offers many rock climbing and mountaineering opportunities. It has 24 hours of daylight in the summer and has Alpine-style ridges, summits and glaciers, but at a height of less than 1,200 metres (3,900 feet). The main centre for rock climbing is Henningsvær on Austvågøya. The main areas for mountaineering and climbing are on Austvågøy and Moskenesøya. Moskenesøya features remote and serious mountaineering whereas Austvågøy is very popular area for rock climbing. For more information, see the walking guide by Dyer and the rock climbing guidebook by Craggs and Enevold (see references). Unstad is one of its better known locations for surfing. There is a well marked cycling route that goes from Å in the south and continues past Fiskebøl in the north. The route is part public road, part cycle-path with the option to bypass all of the tunnels by either cycle-path (tunnels through mountains) or boat. Traffic is generally light, although in July there may be a lot of campervans. Some of the more remote sections are on gravel roads. There is a dedicated cycling ferry which sails between Ballstad and Nusfjord, allowing cyclists to avoid the long, steep Nappstraum tunnel. The route hugs the coastline for most of its length where it is generally flat. As it turns inland through the mountain passes there are a couple of 300–400-metre (980–1,310-foot) climbs. The Lofoten Insomnia Cycling Race takes place every year around midsummer, possible in the midnight sun, but surely in 24-hr daylight, along the whole Lofoten archipelago. The Arctic Race of Norway, the world’s northernmost professional stage race on road bike which takes place every year in Northern Norway, crossed the Lofoten islands during its first edition in August 2013. The race will be back in 2019 from Thursday 15 August to Sunday 18 August. 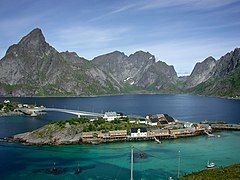 The first two stages will cross the Lofoten archipelago from west to east. The E10 road follows the archipelago southwest to Å. Late August near Eggum, Vestvågøy. The European road E10 connects the larger islands of Lofoten with bridges and undersea tunnels. The E10 road also connects Lofoten to the mainland of Norway through the Lofast road connection, which was officially opened on December 1, 2007. There are several daily bus services between the islands of Lofoten and between Lofoten and the mainland along E10. Røst Airport (9,889 passengers in 2014), which mainly offers flights to Bodø. Stokmarknes Airport, Skagen (93,782 passengers in 2016) is located in Vesterålen. Harstad/Narvik Airport, Evenes has direct flights to Oslo and Trondheim. Bodø is often used as a hub for travel to Lofoten. In addition to air travel there is a ferry connecting Bodø to Moskenes. There is also a ferry connecting Svolvær to Skutvik in Hamarøy, with road connection east to E6. Hurtigruten calls at Stamsund and Svolvær. Edgar Allan Poe's short story "A Descent into the Maelström" tells the story of a man who survived his ship being drawn into and swallowed by Moskstraumen. Jules Verne's novel Twenty Thousand Leagues Under the Sea (1870) concludes with the Nautilus fallen into the Maelström, and Prof. Aronnax, Conseil and Ned Land, who had been attempting to escape when the Nautilus began its fall, washed up on an island in the Lofotens. 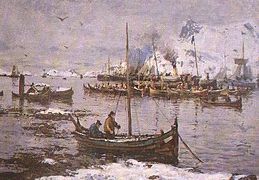 Johan Bojer's novel The Last of the Vikings (1922) tells the story of the Lofoten cod fishermen. 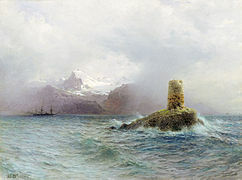 In Nikos Kavvadias's poem "The pilot Nagel", pilot Nagel's birthplace was the Lofoten islands. In Angela Green's novel The Colour of Water, much of the action takes place in Å i Lofoten and climaxes at the Maelstrom. In Ole Edvart Rølvaag's novel Giants in the Earth, the Norwegian protagonists settling in Dakota Territory are immigrants from Lofoten. 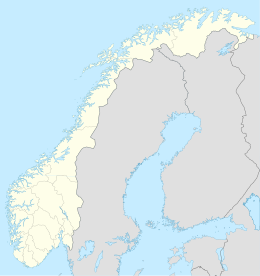 In the film Maelström, Lofoten is where the ashes of Annstein Karson are distributed. The islands of the Lofoten archipelago are known for their natural environment. The area has rugged landscape and unique lighting. Consequently, the islands have long served as an inspiration for artists. 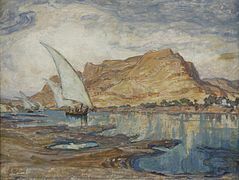 Norwegian painter, Gunnar Berg was known for his paintings of his native Lofoten. He principally painted scenes of the everyday life of the local fishermen. 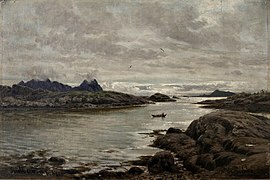 Other artists whose work has been associated with Lofoten include Adelsteen Normann, Otto Sinding, Christian Krohg, Theodor Kittelsen, and Lev Lagorio. In 2004, Nurse with Wound broadcast 24 unexpected radio transmissions from the Lofoten Islands, whose sounds were sourced from the environment and objects found in Lofoten. These recordings are included on their three releases entitled Shipwreck Radio. In the 2015 video game, The Witcher 3: Wild Hunt, a village is named Lofoten within the Norse/Celtic inspired archipelago, Skellige. Henningsvær in Lofoten during fishing season. Sildpollneset and Higravstindan mountains, Vågan municipality. ^ "Norway – Vestvågøy – Vendalsjord". ^ a b c d M.F. (29 Aug 2017). "Why Norway may leave $65bn worth of oil in the ground". The Economist. ^ a b c Bergh, Steffen G.; Liland, Kristian H.; Corner, Geoffred D.; Henningsen, Tormod; Lundekvam, Petter A. (2018). "Fault-controlled asymmetric landscapes and low-relief surfaces on Vestvågøya, Lofoten, North Norway: inherited Mesozoic rift-margin structures?" (PDF). Norwegian Journal of Geology. 98 (4). Retrieved January 29, 2019. ^ Steltenpohl, Mark G.; Hames, Willis E.; Andresen, Arild (2004). "The Silurian to Permian history of a metamorphic core complex in Lofoten, northern Scandinavian Caledonides". Tectonics. 23 (1). doi:10.1029/2003TC001522. ^ Lidmar-Bergström, K.; Näslund, J.O. (2002). "Landforms and uplift in Scandinavia". In Doré, A.G.; Cartwright, J.A. ; Stoker, M.S. ; Turner, J.P.; White, N. (eds.). Exhumation of the North Atlantic Margin: Timing, Mechanisms and Implications for Petroleum Exploration. Geological Society, London, Special Publications. The Geological Society of London. pp. 103–116. ^ Osmundsen, P.T. ; Redfield, T.F. ; Hendriks, B.H.W. ; Bergh, S.; Hansen, J.-A. ; Henderson, I.H.C. ; Dehls, J.; Lauknes, T.R. ; Larsen, Y.; Anda, E.; Davidsen, B. (2010). "Fault-controlled alpine topography in Norway". Journal of the Geological Society, London. 167: 83–98. doi:10.1144/0016-76492009-019. ^ Martin, Stephen. Penguin. Reaktion Books Ltd., 2009, p. 22. 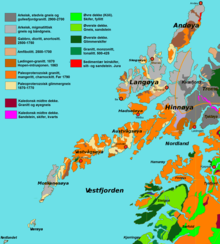 ^ "ROST II, NORWAY (INCLUDING JAN MAYEN AND SVALBARD) Weather History and Climate Data". ^ institutt, NRK og Meteorologisk. "Weather statistics for Værøy". ^ "Ekstremsurferne Inntar Lofoten". nrk.no. Opphavsrett NRK. ^ "The Northern Lights Route – Lofoten in Paintings". Rines, George Edwin, ed. (1920). "Lofoten" . Encyclopedia Americana. Dyer, Anthony; Baddeley, John; Robertson, Ian H. (2006). Walks and Scrambles in Norway. Rockbuy Limited. ISBN 9781904466253. Webster, Ed (1994). Climbing in the Magic Islands (in Norwegian). Henningsvaer, Norway: Nord Norsk Klatreskole. ISBN 9788299319904. Craggs, Chris; Enevold, Thorbjørn (2008). Lofoten Rock. Rockfax Ltd. ISBN 9781873341667. 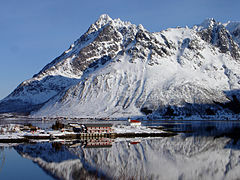 Wikimedia Commons has media related to Lofoten. 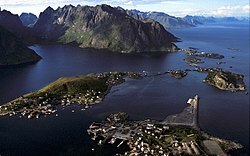 Wikivoyage has a travel guide for Lofoten. Wikisource has the text of the 1905 New International Encyclopedia article Lofoten. 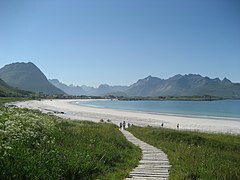 The first Lofoten website (1996) with special emphasis on the islands of Moskenes and Flakstad.